It will literally 'listen' to your needs. Everyday objects are getting fancier by the minute, thanks to technological innovations left and right. The latest to get an update? 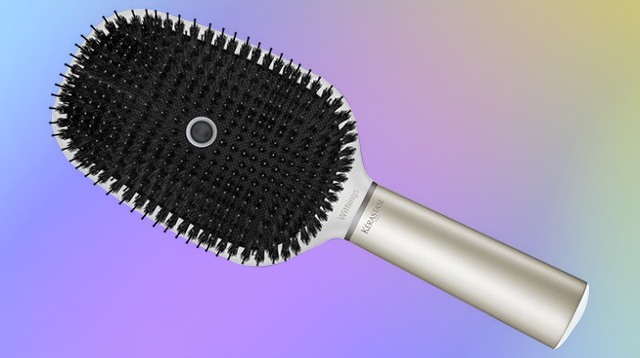 The standard hair brush. At Las Vegas’ CES 2017, a global consumer electronics and technology tradeshow, Kérastase unveiled a $200 smart brush called the Hair Coach, Fortune reports. "It will basically be your hair coach," Guive Balooch, VP of L'Oreal's Technology Incubator, said. "When you brush you hair, it will do a good job to make sure your hair is smooth." How exactly does it work? According to Adweek, users download an app that should be operated in tandem with the brush. The Hair Coach delivers information—such as whether the hair is dry or frizzy, if it’s being brushed wet or dry, and if it’s being handled too roughly—via Wi-Fi and Bluetooth to the app, which will then analyze everything using algorithms created by L’Oreal. And that part about "listening" to the hair’s needs? It’s not all for show—the smart brush has a built-in microphone to record the sound of brushing, as well as other sensors to count the number of strokes and measure the force used. The app will then suggest personalized tips and Kérastase products to help improve the quality of one’s hair. The Hair Coach is expected to launch in late 2017.